Easy Peasy Blueberry Muffins that start with a biscuit baking mix and local Texas blueberries. Blueberry Muffins are a favorite in our house especially for a quick breakfast. I do have to confess though that on busy school mornings I tend to use the pre packaged muffin mixes. Yep guilty as charged! I can't help it they're a great time saver, just add milk, mix and bake. Not homemade by far, but at least it's something to pair with cereal or oatmeal before school. 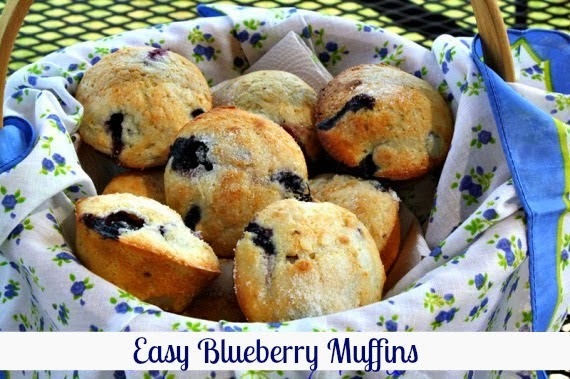 When I do have time to whip up muffins from scratch my Easy Blueberry Muffins are always a hit. I know you wouldn't consider this a scratch recipe since I'm using a baking mix. I love baking mixes especially to help shortcut a recipe. Plus they can be the perfect base for a lot of great dishes. Well to make blueberry muffins you need blueberries. I don't buy them often because they're so pricey, but when I do find them on sale I always stock up. I love to freeze them to use later when blueberry season is far behind us. We used to pick fresh berries at a local pick your own farm, but haven't been in quite some time. The last couple years the brutal Texas heat has made it unbearable for berry picking. If it's not the heat than most likely the sun has damaged the crops, so there's no blueberries to be picked. The blueberry farm is a bit of a drive, but worth it in my opinion because you get the freshest of berries. Not to mention you get to pick them yourself. The last couple of visits we paid $8 for a gallon size basket. Which is awesome, so hopefully we can make it out to the farm again in the near future. Until then I depend on the berries that I find at the grocery store. I can usually find some pretty good deals on produce at my local Walmart, so that's where I have been purchasing my berries lately. As part of the Walmart Moms Program were kept up to date on a lot of Walmarts upcoming programs. Last year I was informed that Walmart was partnering with local farmers to offer it's customers locally grown produce. I was really excited about this new feature, but had yet to see it my local store. Well over the last couple months I have noticed more and more fruits and veggies sold at my local Walmart are locally grown. I'm so excited because I was beginning to wonder if it was ever going to be available at my store of choice. Then one day I walked into my local Walmart and there it was new signage throughout the store (locally grown). Any locally grown item will display a "Locally Grown" label or symbol right on the bin. You will even find that some of the bagged fruits are locally grown as well. Having locally grown produce at the store is such a bonus for me. Now I can help support my local farmers while I shop directly in the store. If you're local Walmart hasn't started selling local fruits and vegetables yet be patient, because it's coming. Keep a eye out for the new signage in you're local store so you too can help support your local farmers. Before I forget I wanted to share the recipe for the Easy Peasy Blueberry Muffins that I baked using locally grown Texas Blueberries. Enjoy! Preheat oven to 400 degrees F. Grease bottoms only of 12 medium muffin cups or line with paper baking cups. Using a small bowl toss blueberries in a 2 tablespoons of baking mix and set aside. (This will keep the blueberries from sinking to the bottom). Beat egg slightly in medium bowl; stir in remaining ingredients except blueberries just until moistened. Fold blueberries into batter. Divide batter evenly among cups. Sprinkle a little granulated sugar on top and bake for 15-18 minutes or until golden brown. These are such a classic. I had no idea Walmart was selling local fruit. Not a big Walmart shopper myself but that's good to hear. I agree Val. I can't always get to the PYO Farms or the Farmers Market. It's great knowing that I can go to my local grocery store and shop for fruit and veggies and still support local farmers in my area. I'm sure the farmers appreciate it as well. Hey, that's my walmart! If a lady waves at you and you don't know her, she knows you, wave back. Haha. I enjoy your blog and use many of your recipes. F from Rockwall. Wow Frances that's so cool. If you see me please stop and say hello. More than likely I have my kids with me, so just look for the mom with the kids fighting with each other. LOL goodness they can never get along in the store. I can't wait until they start building the Walmart in Royse City than I won't have to go out to Rockwall for just milk or something.